Anyone who has ever stumbled upon my personal blog will know that I'm big on end-of-the-year recap posts. They're my way of summing up a year gone by, while looking forward to a new one to come. 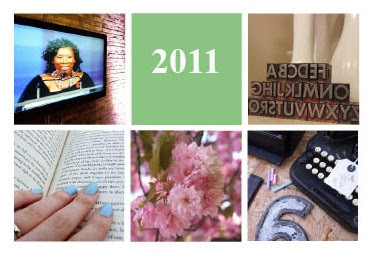 2011 was the year that I finally started this blog. I first planned to begin Not My Typewriter a number of years ago, buying the domain way back at the end of 2009, but it took an amount of restlessness at work to finally get things moving forward in January 2011. I quickly learned that I gained far more than simply a place to ramble about books I loved, and those I hated; rather, I've gained a community of book lovers, especially through Twitter, who I have loved engaging with in 2011. These 140-character exchanges became something I looked forward to after long nights at the office. I look forward to a 2012 that hopefully means fewer long days and nights at work, so I can read more, blog more, and hopefully, travel more. When I was in university, I always promised myself I wouldn't spend my life in a cubicle, staring at a computer screen for hours at a time. While I've avoided the cubicle, the 9 to 5 in an office staring at a computer screen can be exhausting, even though I'm lucky enough to work in an industry I love. I'm not sure that I'm ready to leave it behind quite yet, but I am hoping for at least some adventure this year, made possible by a little bit of financial flexibility since paying off my student loan. I'm itching to be a little reckless, and take some risks I couldn't take before. I hope you all enjoyed a safe New Year's Eve and a relaxing New Year's Day. All the best and happy reading in 2012. As Dilbert, avoid the cubicle at all costs. Thank you for your blog. I have enjoyed it through the last quarter or so of the year when I first found it. I have enjoyed your posts and look forward to more in 2010. Have a prosperous and very happy New Year! Thanks so much, Bill! I'm glad you've enjoyed reading what I've come up with so far. All the best in the New Year!